Protein isolate obtained from vegetables, designed mainly for vegetarians and those bored with standard high-protein nutrients. High-quality protein with good taste and solubility! Wealth of vitamins and minerals! BEST PRODUCT IN ITS CATEGORY! 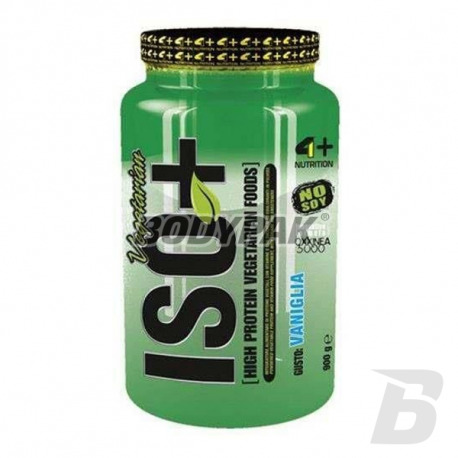 4+ Nutrition ISO + Vegetarian is a high quality (80%), pure whey protein isolate derived from vegetable composition containing B vitamins and minerals. This material is considered to be the most perfect and most valuable protein source used in supplementation sports diet. Now also you will be able to try this advanced product. Do not wait until others you ubiegną. Interesting escape from ordinary soy protein whose taste has nothing to do with this conditioner. 4+ Nutrition ISO + Vegetarian characterized by a high nutritional value and anabolic activity, which makes it was considered the most valuable sources of dietary proteins for high-performance athletes and physically active people. This product is a revolution in the market because the first is aimed at vegetarians, who from now on with a clear conscience can supplement your diet proteins of the highest quality! Putting on the proven raw material manufacturer has managed to achieve a high level of concentration of the protein while maintaining an interesting flavor. 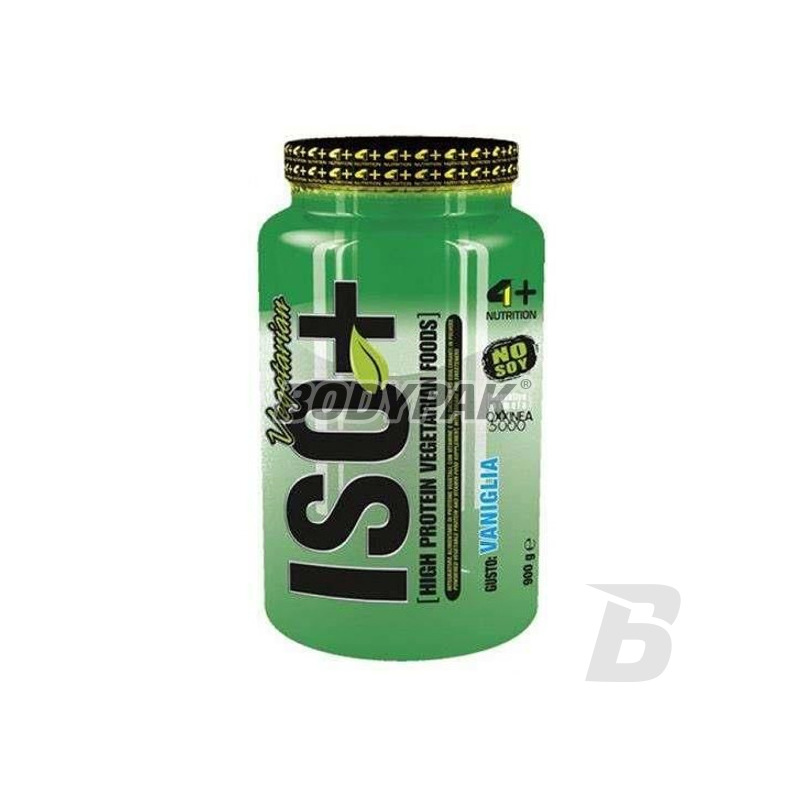 4+ Nutrition ISO + Vegetarian is definitely the best way to supplement the protein, allowing continuous development of lean muscle mass, irreplaceable during dieting and equally suitable for combating deficiency of protein in your daily diet. Additional content of vitamins and minerals also promotes metabolism and protect muscle cells. With the proper composition of micro and macronutrients, your body gets everything it needs to function efficiently and develop the growth of your muscles! 4+ Nutrition ISO + VEGETARIAN IS THE BEST CHOICE! Consume 3 scoops of the product, ie. 30 g. Dissolve in a 250 ml-300 ml of water or other beverages. Consume immediately after preparation. Do not exceed recommended servings for consumption during the day. Składniki (dla smaku owocowego): izolat białka roślinnego (z grochu i ryżu); substancja słodząca: izomalt; aromaty; nośnik: chlorek magnezu; witamina C (kwas L-askorbinowy); Oxxinea 5000 (ekstrakt z: moreli, ananasa, czerwonego pomarańcza, jabłka, czarnej porzeczki, papai, białego i czerwonego winogrona, wiśni, jeżyny, grejpfruta, truskawki, jagody, melona, pomidora, czosnku, brokuła, marchewki, cebuli, oliwki, kiełków pszenicy, zielonej herbaty, szparagów, kapusty); substancja słodząca: glikozydy stewiolowe; glukonian żelaza, glukonian cynku, pantotenian wapnia, witamina B6 (chlorowodorek pirydoksyny), kwas foliowy, witamina B12 (cyjanokobalamina). Smak OWOCOWY wg mnie rewelacyjny w porównaniu z innymi białkami np. sojowymi. Dobrze się rozpuszcza i dobrze smakuje. Polecam jednak ten smak owocowy. Z powodu alergii na produkty mleczne szukam substytutu whey'a, ale niestety "4+ nutrition" odpada, testowałam już wiele wegańskich białek i to jest jedno z gorszych. Mam waniliowe. Bardzo specyficzny smak (jakby się ziemię jadło), próbowałam je polepszyć nawet wodą kokosową, ale to nic nie daje. Poza tym, tak jak ISO i hydro tej firmy, jest albo bardzo słodkie albo w przypadku dodania dużej ilości wody - bardzo rzadkie i niedobre. Pierwszy i ostatni raz je kupiłam. Inne białka roślinne wydają mi się też bardziej sycące. Jedyny plus to dość duża zawartość białka w białku :) ale podobny profil można znaleźć również w produktach innych firm.